As President Obama and Governor Romney prepare for the first presidential debate this evening, I thought I would offer my vision of where our nation’s leaders should try to take the country. Although there are many areas in which the American economic performance has been disappointing, one task we’ve been exceptionally good at is finding and producing more natural gas. In fact, America is currently just burning some of this potentially useful fuel as a waste product associated with oil production. On a dollar-per-BTU basis, natural gas and crude oil sold at a similar price 10 years ago. But today, energy from oil costs 6 times as much as natural gas. Any move to replace oil with natural gas would pay a big economic dividend. Black line: price of crude oil (West Texas Intermediate, dollars per barrel, beginning of month values, from FRED). 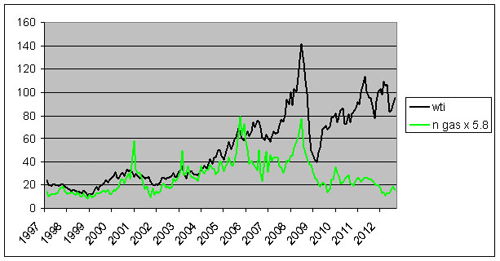 Green line: 5.8 times price of natural gas (Henry Hub Gulf Coast spot, dollars per million BTU, beginning of month values, from EIA). One obvious strategy is to heat more homes with natural gas instead of heating oil. U.S. consumption of heating oil averaged 900,000 barrels/day in 2005 but has been about 400,000 b/d this year. New pipelines such as those recently approved serving New York City will help make further progress in this direction. The biggest uses of oil are for transportation, where there are three main options for using natural gas. For heavy-duty trucks, it’s possible to use fuel tanks that keep the gas cold enough (-260o F) to be stored in liquid form. In 2010, nine million heavy-duty vehicles on U.S. roads consumed 2.2 mb/d of petroleum. Of these, 40,000 (or 0.4%) were using natural gas. 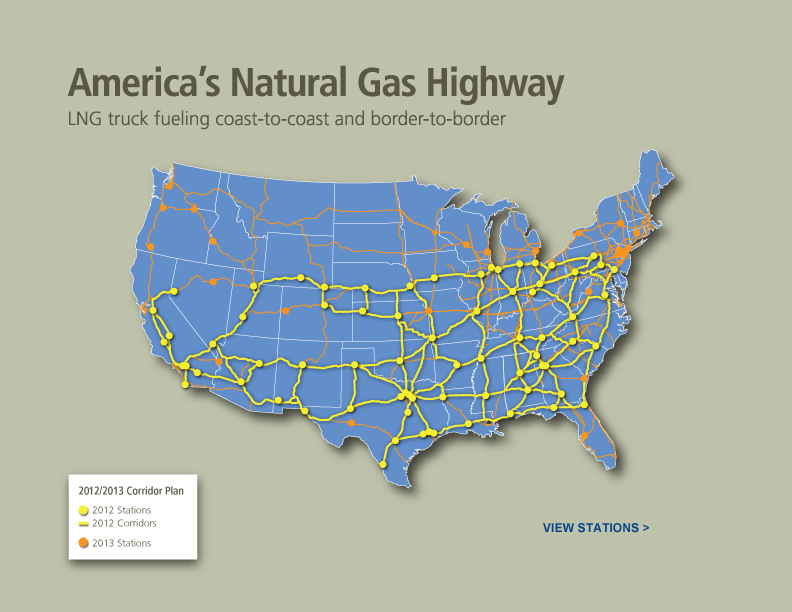 Clean Energy Fuels Corp. (CLNE) is planning to complete 150 new LNG fueling stations by the end of next year to connect major trucking corridors across the country. Waste Management Inc. (WM) plans for 80% of the trucks it purchases during the next five years to be fueled by natural gas. A second option, available to any vehicle, is to compress the natural gas at sufficiently high pressure that it can be reasonably transported and stored. According to the Department of Energy, in July LNG was available at a retail price of $3.35 per diesel gallon equivalent, while compressed natural gas was $2.28. A recent study by MIT Professor Christopher Knittel estimated that a typical driver of a 30 mpg sedan would save almost $7,600 over the life of the car in fuel costs by switching to natural gas, but only pay an extra $5,500 for the vehicle. A 15 mpg pickup might save almost $4,200 net of the extra cost of the truck. When you take into account other benefits to society from using natural gas, such as lower pollution, fewer greenhouse emissions, and less dependence on imported oil, Knittel calculates that the net gains to society from a switch could be twice the savings to individuals. Why then aren’t more consumers switching to natural gas right now? According to the Department of Energy, as of May there were 1,047 CNG fueling stations in the U.S., compared with 157,000 stations selling gasoline. 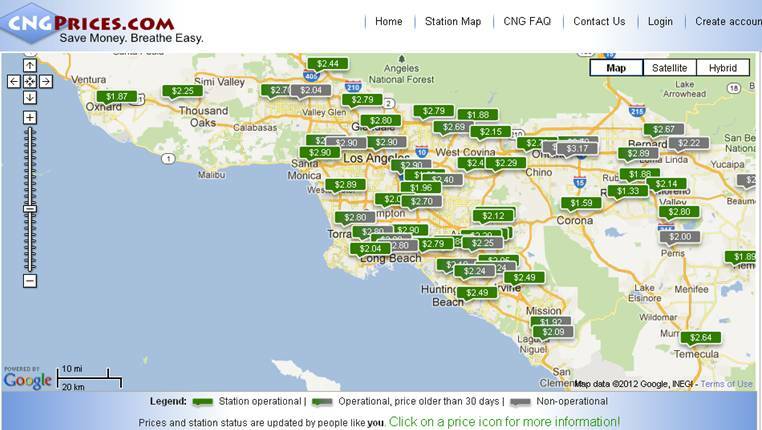 Of the CNG stations, fewer than half are open to the public, and more than a fifth are located in California. 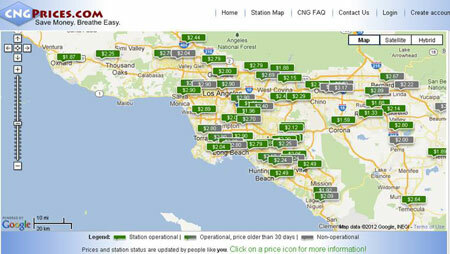 Map of CNG stations and prices in Los Angeles, with prices in gallon of gasoline equivalent. Source: CNGPrice.com. Large-scale adoption of natural gas vehicles requires coordination between vehicle manufacturers, consumers, and refueling stations– either existing gasoline stations or replacements. This creates a chicken-and- egg problem, or a network externality issue. Consumers are unwilling to purchase natural gas vehicles before a refueling infrastructure is built, but businesses will not invest in natural gas refueling stations until there is consumer demand. Each side would be better off if the other side acted first, but neither is willing to move without the other. Left alone, network externalities continue the dominance of the status quo technology when, from society’s perspective, it should be replaced with a new technology. A third option for using natural gas as a transportation fuel is to convert the gas into methanol. Again this promising technology faces significant infrastructure switching costs. Reform regulated pricing structures to allow natural gas utilities to sell to transportation users at closer to marginal cost instead of average cost. Facilitate and encourage private access to existing CNG and LNG stations. Establish an industry consortium to investigate and coordinate on LNG refueling infrastructure. Include methanol as a product satisfying renewable fuel standards. Subsidize natural-gas powered vehicles by an amount commensurate with their estimated external social benefits. To these I would add the possibility of giving vehicle manufacturers credit toward Corporate Average Fuel Economy standards of any vehicles powered by natural gas or methanol. My idea is that if a manufacturer sells one car that gets 20 miles per gallon of gasoline, and a second vehicle that uses no gasoline at all, it gets credited for producing two cars with an average fuel efficiency of 40 miles per gallon. Another obvious idea is to streamline the EPA approval process for alternative fuel and engine designs. I would also add that a deficit-minded alternative to Knittel’s last suggestion of subsidizing natural gas vehicles would be to tax conventional gasoline vehicles, or gasoline itself, by an amount commensurate with their estimated external social costs. I’m interested to hear if some of our readers have other suggestions.